Rev. B. L. James was born in Charleston, WV, on November 24, 1947, and was born again October 6, 1975, in the midst of a great crisis. Following his graduation from Nazarene Bible College, B. L. pastored churches in WV, TX, MT and CO. He has hosted numerous radio programs as well as served on town committees. He has held tent campmeetings, conducted revival services and belonged to a prison ministry where he preached and ministered to inmates. He has been called upon to council pastors and lend leadership to their congregations. God has lead B. L. into the understanding of the gifts in the church and the five-fold ministry. His desire is to be used of God in the establishing and building a five-fold ministry church. B. L. has also authored the book, Nothing but the Blood ... How Christ�s Passion Reversed the Curses of Sin, published by Tate Publishing as well as study guides for the book. He is currently working on other books. 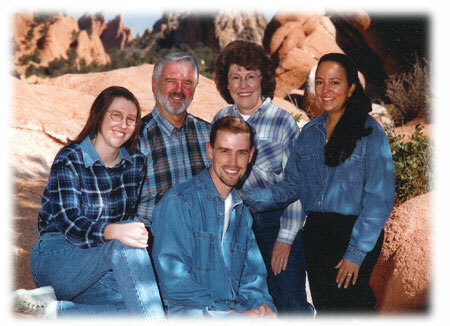 B. L. and his wife, Lynn, live in Colorado Springs, CO. Also pictured are their daughter, Theresa, son, Scott and daughter-in-law, Erin.